From Butler, go south on US Highway 71 to the 71/Missouri Highway 52 junction (blinker light), turn left (east) onto Hwy 52 and go for 9 1/8 miles to County Highway O, turn right (south) onto O and go for 2 miles, turn right (west) onto gravel road (county road 2116) and go for ¾ mile. The cemetery is on the west side of the road off the curve. The land for Rogers Cemetery was given by James Madison Rogers. The first known burial was William McManus in 1867. Judge J. M. Rogers a prominent farmer and stock feeder of Pleasant Gap Township, owes his nativity To Claiborne Co. east Tennessee, where he was born August 8, 1815. His father, John Rogers, was a native of North Carolina, and was born December 27, 1781, and his mother, whose maiden name was Sarah Lynch, came originally from South Carolina. The former was a soldier in the War of 1812, and also in the Florida Seminole war, in 1836; in the latter war he was captain of a company. J. M. Rogers moved to Missouri with his parents in the spring of 1837, and located in what is now Platte County, they being among the first families settling in Platte Purchase. John Rogers died there February 18, 1861. The subject of this sketch spent his youth on a farm, and was married in Platte County, November 15, 1841, to Miss Sarah Moon, a daughter of Joseph Moon; she was born in Jackson Co. After his marriage he farmed in Platte Co. for about 10 years. Mrs. Rogers died there December 10, 1849, leaving two children living: Angeline (now Mrs. Gasaway), and Eliza J. (now Mrs. J. C. Hall). Mr. Rogers was married again in Cass County, March 12, 1853, to Miss Lucinda L. Settler, a daughter of Mansfield Settler. She was born in Missouri. In April, 1851 he moved from Platte to Bates County and located some fourteen miles west of Butler, where he resided for about eleven years; Mr. Rogers lost his second wife, who died on December 20, 1860. There is one son by this marriage, John L.
He was married here to his present wife, Miss Lucy F. Wilson, of Missouri, March 12, 1861. They have seven children: Sterling C., George Eli, Emily L., William D., Hettie L., Carrie V., and Perry V. In 1862 Mr. Rogers went from Bates to Platte County, and resided there until October, 1865, when he returned to Bates and purchased his present farm in section 2. 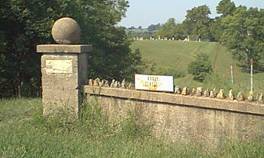 He has over 1,000 acres of land, with some 600 acres fenced and 300 acres in cultivation and meadow and the other 300 being in blue grass pasture. There is a fine apple orchard of about twenty acres on the place. He makes a specialty of handling and feeding cattle, and is also quite extensively interested in the sheep business and has a flock of about 150. Mr. Rogers is identified with the Democratic party, and has filled several minor offices in his township. He was elected one of the county judges in 1853, and served for about one year. He served as township clerk about 10 years, and also as justice of the peace of Pleasant Gap Township. Mrs. Rogers is a member of the Missionary Baptist Church. Source: "History of Cass and Bates counties, Missouri" 1883 -- pages 1324-1325. Note: The 1850 census also lists a son, Lawrence, and Eliza Jane is listed on the census as Mary J.